This adage couldn’t be more true in the fight-marred game between Gilas Pilipinas and Australia in last Monday night’s FIBA World Cup qualifier. In front of 22,000 spectators at the Philippine Arena, sportsmanship and professionalism were thrown out the window as punches and kicks were traded by the players with officials and fans also getting in on the melee. It was an incident that hogged local and international headlines and stirred debates online. If the highly-tensed and physical Gilas-Boomers tussle made you go “WTF just happened?! ?”, here are a few other unforgettable testosterone-filled moments in sports where brawns overpowered the brains. Long before Ron Artest thought of being an instrument of “world peace,” he was one of the notable figures in altercation, in what could be the most infamous brawl in the history of the NBA, between the Indiana Pacers and Detroit Pistons that started on the court and spilled over to the sidelines. 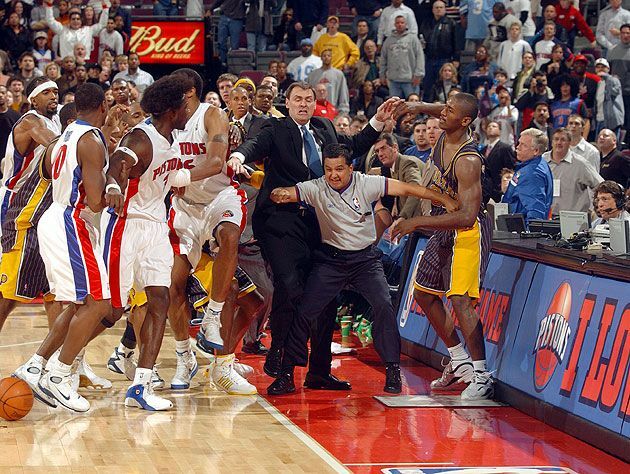 A skirmish on the floor between Artest and Ben Wallace carried over into the stands. Artest, having decided to pull away from the tension, laid himself down on his back on the scorer’s table. But it did not take long for hell to once again break loose. A fan threw a cup towards Artest and hit him on the chest. Restraining him was futile and Artest was quick to jump to the stands and in seconds, players and fans were entangled, bottles tossed, and chairs thrown. That ugly incident resulted in $10-million in forfeited salaries and players suspended for 146 games. Even “His Airness” can lose his cool, too. When two basketball icons clash not just with their talents but also egos, expect fireworks. It didn’t take long into the Chicago Bulls’ game versus the Indiana Pacers before Michael Jordan locked horns with Reggie Miller. Tempers reached boiling point when Miller tripped Jordan during a fastbreak midway through the first period. Several plays later, Jordan retaliated with an elbow to the face as they jockeyed for position. As they make their way to the other end of the floor, Miller shoved Jordan from beneath the basket and this was where Chicago’s biggest star lost it. Jordan chased Miller, caught him, scraped Miller with a hit to the face and, as the two locked in a bear hug, clawed at his eye. Miller fought back, and the benches cleared. Miller and Pacers head coach Bob Hill got ejected, while Jordan took deep breaths and shot his free throws. The storied rivalry of the New York Yankees with the Boston Red Sox has a long list of noteworthy moments. And that one game day at Fenway Park in July 14 years ago produced another golden memory: Catcher Jason Varitek planting his glove on Alex Rodriguez’s face. Things got heated when Red Sox starter Bronson Arroyo pierced Rodriguez in the elbow with a fastball. A-Rod didn’t take it lightly and hurled invectives at Arroyo as he charged towards first base.That’s when Varitek intervened, stepped in between the two players and barked back at the Yankees slugger. Rodriguez dared Varitek to “bring it on” and Boston’s captain was more than willing to oblige resulting to the picture-perfect moment you would see hanging on the walls of many watering holes in Beantown. It wasn’t the send-off Zinedine Zidane, one of the most decorated names in the history of football, would have wanted as a player. One fleeting moment during the 2006 World Cup final in Berlin, with France and Italy locked at 1-1 in extra time. As Zidane and the Italian midfielder Marco Materazzi were jogging up the pitch close to each other, the world witnessed what would be one of the most controversial exits in a match ever. As a retaliation from Materazzi’s shirt tugging and vocal provocation – initially thought to be an insult to Zidane’s mother, “Zizou” gave a different kind of header as he forcefully drilled his head onto his defender’s chest sending him crashing to the ground. A red card from Argentinean referee Horacio Marcelo Elizondo immediately became the curtain call to the football great’s career and handed Italy a 5-3 victory off penalties and become world champions for the fourth time. 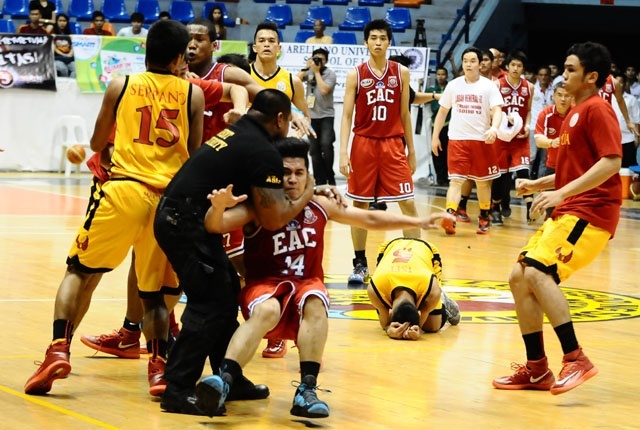 The local collegiate basketball scene is not without its share of on-court fracas. It was one of the ugliest in-game altercations in the country’s oldest college league. The EAC Generals were en route to securing a win holding an 86-77 edge in the final 28.5 seconds when John Tayongtong intentionally bumped the Cardinals’ CJ Isit at center court. Isit’s teammate Hesed Gabo retaliated by throwing an elbow to Tayongtong who answered with a punch. Things immediately escalated from there – both benches clearing with players rushing onto the court, with the referees, venue security, and team officials from both sides trying to pacify the situation. The NCAA cracked the whipped on the erring parties and meted out suspensions to 17 players with Tayongtong being slapped with the heaviest penalty of being suspended for five outings.